KYVAN Foods’ Reggie Kelly brings his soul food Mississippi roots to salsas, sauces and other condiments via his KYVAN label. 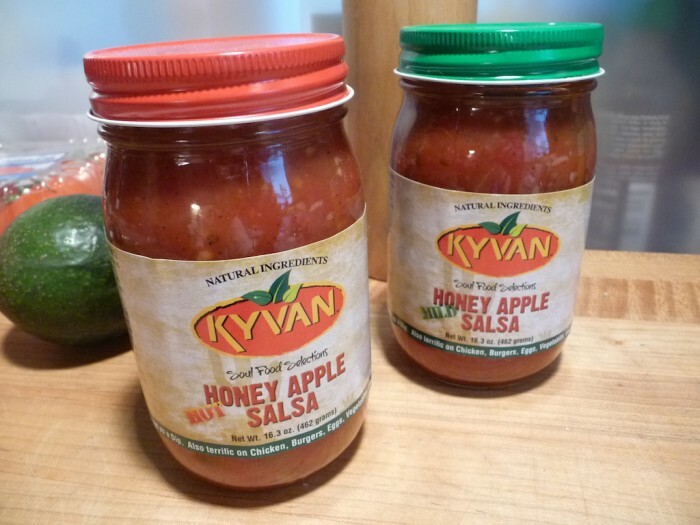 Among the many offerings of sauces and condiments from KYVAN, we’re looking at their two salsas today. We love salsa, and the more unique the flavor the more interesting the salsa. KYVAN’s Honey Apple Salsas fall into this area. Take salsa, add honey (+1), add apple (+1) add fresh peppers and you have a very unique salsa flavor profile. And in this case, it’s a very edible and delicious dip. Good on eggs, steaks, and just about anything you’d put a sweet salsa on to get some zing. 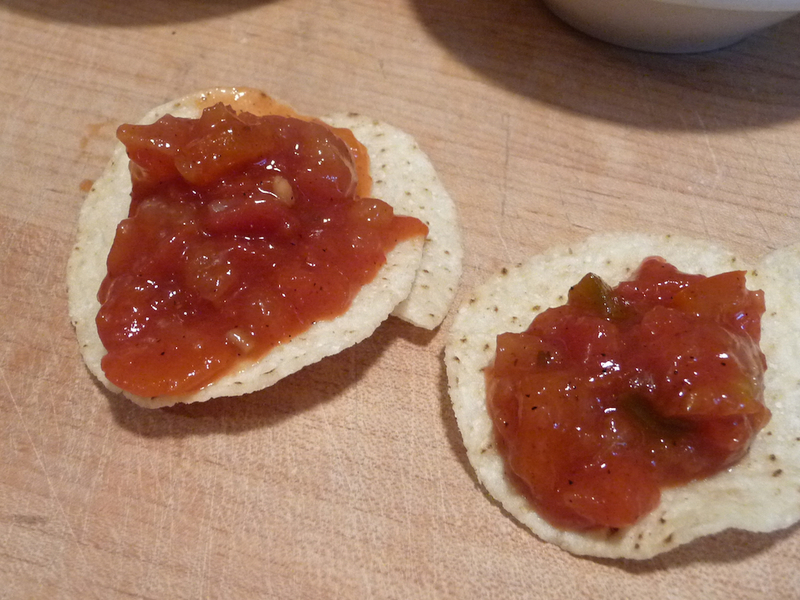 Think sweet pepper relish as a salsa base. It’s that sweet and peppery. 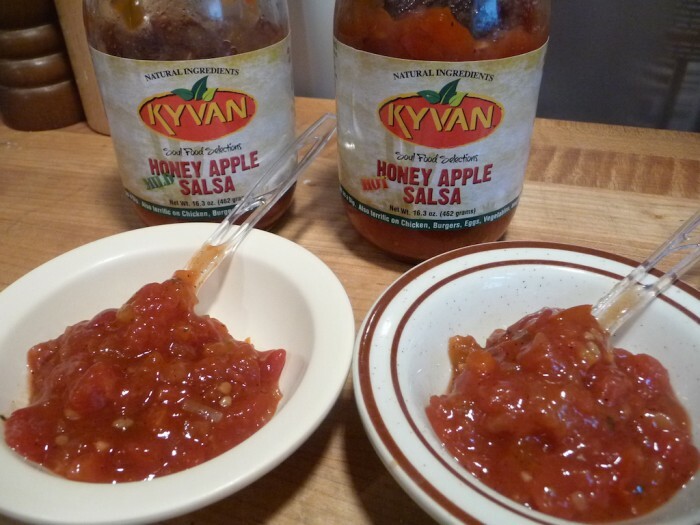 The “Mild” version of KYVAN Honey Apple Salsa is very sweet with little heat. Texture & Appearance: Very chunky and bright red in color. It’s bell peppers in a sweet sticky sauce. familiar. Taste Straight Up: Slightly spicy, sweet peppers with garlic. The honey and apple tastes bring the sweet, while the bell peppers bring the heat (mild as it is). This tastes very much like a sweet pepper relish kicked up to salsa levels. delicious. Heat Level: ½☆☆☆☆ Mild, mild, mild. And that’s a good thing here. It never tries to be anything else. a super sweet salsa. This is a sweet honey and apple based pepper relish that is in a jar of salsa. And it works! A refreshing change of pace from other traditional salsas. As you will see below, the “Hot” version is slightly different in ingredients and satisfaction. The “Hot” version of Honey Apple Salsa has the exact same ingredients, save for the added “natural flavors” added near the end. These “natural flavors” are what bring on the heat of the “Hot” version. It’s hard to tell from the pic, but the mild (on left) is much brighter in both color and flavor. The hot version is darker in color and taste. Quite a jump in heat level without disclosing exactly what the ingredient is. What exactly are “natural flavors”? I suspect dried chile peppers or dried extracts. Either way, I think you’ll like the “Mild” version and the “Hot” version as well. Cooking is a way of life in the South and nobody knows that better than NFL Pro Reggie Kelly, owner of KYVAN™ Soul Food Selections. Reggie grew up in Aberdeen, MS and played football at Mississippi State University. He also excelled at the Pro level by playing 13 years in the NFL with the Cincinnati Bengals and the Atlanta Falcons. Give us a FOLLOW to stay abreast of new products, new locations and giveaways. You’re welcome Reggie and family! Stay tuned to another review or two about the KYVAN lineup!